Moscow and Beijing have taken a swipe at the US, criticizing its “unilateral action” in many parts of the world. Discussions between China’s top diplomat and State Councilor Yang Jiechi and Russian Security Council chief Nikolai Patrushev on Monday resulted in both sides agreeing “to support each other’s efforts to safeguard sovereignty, territorial integrity and security and support each other’s development and opposed to foreign interference in each other’s domestic affairs”, said an official statement. “The two sides opposed protecting one’s own security at the expense of the others’ interest, or unilaterally develop and deploy anti-missile systems to harm global stability and peace,” said a statement quoted by Chinese news agency Xinhua. Washington has positioned anti-missile defense systems in Japan and Europe. Russia says the US-led project for a European antiballistic missile system, which Washington long insisted was targeting ‘rogue nations’ like Iran and North Korea, is actually aimed at Russia. China had also hit out at the US for positioning a missile defense radar in Japan. US Defense Secretary Chuck Hagel has said two Navy destroyers equipped with missile defense systems would be deployed to Japan by 2017. Beijing has said the United States is damaging stability in the Asia-Pacific region by such actions. Meanwhile, on Monday, Russian and Chinese officials also agreed to “constructively cooperate with each other in the Asia-Pacific region in a bid to jointly uphold regional peace, stability and prosperity”. The two allies are gearing up to challenge the US presence in the Asia-Pacific and the much-hyped Asia-Pivot of the US. Patrushev and Jiechi also took stock of the preparations for the upcoming visit of Russian President Vladimir Putin to China to commemorate the 70th anniversary of the end of World War II, or what is known as the victory of China’ s War of Resistance against Japanese Aggression and the World Anti- Fascist War. 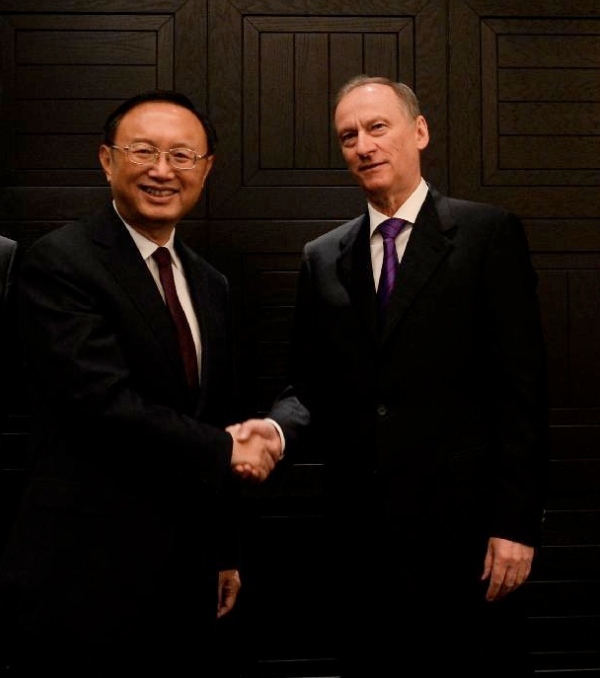 Russian Security Council chief Patrushev is hosting the BRICS national security advisors in Moscow. Ongoing discussions include cyber-security and terrorism threats. Russian President Vladimir Putin will meet the five security chiefs on Tuesday in the Russian capital. Russia has been holding a flurry of BRICS-related events ahead of the 7th Leaders Summit in July.